Festive jumper dress from really nice red plaid wool! A new dress for holiday parties! 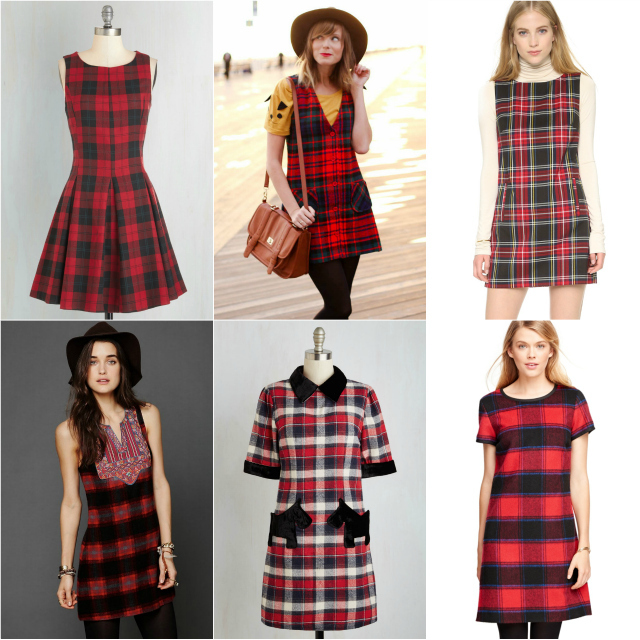 I don't know about you, but for me "plaid jumper dress" doesn't inspire current high fashion images... I'm thinking back to like something the mom might have worn on Home Improvement?? But somehow I decided to make myself one out of this very nice quality red, black, and grey plaid (vintage?) wool I got at the thrift store earlier this fall. I picked it up on a whim since I was in a plaid mood, but I thought it was a cheap poly suiting. I figured, maybe I'd make a tree skirt or something out of it. But upon closer inspection... I felt (and smelled) it was really wool, and the selvage said Evan Picone, I think--vintage 80's or 90's, maybe? ...which helped me design it as a simple shift dress shape, with little patch pockets cut on the bias. I used a tried and true pattern, Simplicity 2584 (see everything I've done with it here). I used a really nice lining, too, a nylon/spandex blend that almost feels like China silk and is super smooth going over the head. Scroll down for a list of the modifications I did to the pattern! I wore it on Thanksgiving!! It's the time of year for red plaid and wool! I think the motorcycle jacket really adds some complexity and edginess to the simple, sweet shift dress, don't you? (Similar here, here, and here.) The red scarf is 100% wool like the dress, something my mom bought for me when we were in Paris when I was 15. The booties are new and go with everything--find similar here, here, and here. Think it could dress up for a more evening look with a few changes to the outfit, too!